I had a very difficult birth with my oldest child, ending in an emergency c-section, and a couple of days later, a complication called an ileus (an extreeeeemely painful paralyzed bowel which was extremely painful and caused my belly to swell up like I was seven months pregnant again.) I was in the hospital for four days, and my special experience and my insurance won me the honor of a visiting postpartum care nurse to check on both me and my baby at home a few days later. Thank God for her! Noticing that, over a week postpartum, my feet were still roughly the size of an elephant’s, she checked and found my blood pressure to be alarmingly high and reported it to my doctor. So my doctor made me go in, and I received treatment for that before any more complications could develop. Though she also checked on my baby’s health, that postpartum care nurse was there for both of us, and she made a real difference in my life that day. As I talked to my other new mom friends about my experience, I realized that the postpartum care nurse who had visited my home was a rarity. Virtually none of my peers had had anyone come and check up on them after they had a baby. 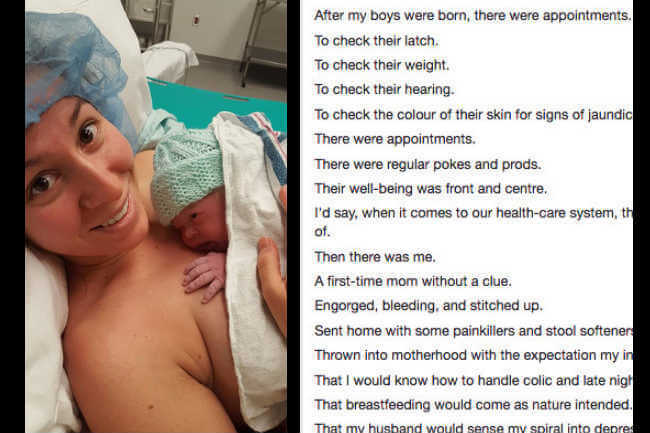 They all saw their doctor about six weeks later for a postpartum checkup, as is sadly the norm in our society. When I had my next baby, it was a planned cesarean sections. No complications, no long hospital stay, and no visiting nurse. I am really not sure, looking back, if the lack of postpartum care nurse was because of an insurance change or simply because I had a “normal” delivery this time. Weeks later, I found myself in the pediatrician’s office crying my eyes out not about my newborn, but about my sick toddler. My son’s pediatrician was so concerned about me that he suggested that I contact my doctor. Here was a medical professional who thought this new mom might need help, but unfortunately he was not equipped to help me. And my next doctor’s appointment wasn’t for another month. Luckily, my situation was extreme exhaustion from a newborn who didn’t sleep and nursed around the clock and a very cranky sick toddler who had physically hurt my recently-surgeried body by throwing a tantrum in the doctor’s office waiting room, and not postpartum depression. After I had my third child, my pain medication in the hospital did not work well (the nurse wouldn’t believe me that my pain ball wasn’t actually sending any pain medication into my body. Until it was time to discharge me and she removed it, and discovered it was broken. In hindsight, I should have advocated HARDER for myself. UGH.) and that night when I got home I cried my eyes out just trying to climb the stairs to my bedroom. It was five days before Christmas, and my husband was left to care for three children and a wife in extreme pain. A few weeks later, my C-section incision came open: it was before my six-week postpartum visit to the doctor, and fortunately I was able to see her quickly and she patched me back up. Now the mother of three, I had been over-doing it during my postpartum period, but really, what choice did I have? My healing got very interrupted, and there wasn’t anything to be done about it until it was too late. To say that postpartum care is extremely lacking in general for mothers is an understatement. Babies have to see the doctor at one week, two weeks and four weeks old at a bare minimum. But moms, whose bodies have been through a serious trauma, are discharged from the hospital, not to be seen or checked up our on again for a full six weeks. Does this seem messed up to anyone else? “We slip through the cracks.” Could that be any more true? I had not really thought about it, since my postpartum experiences were so long ago (my youngest is almost eight), but in the case of my second and third child it’s totally true. My health seemed to be an afterthought. I don’t think our health care standards in America are going to change anytime soon, so if you’re a new mom or about to give birth, it’s important that you and your partner advocate for your own postpartum care. Start in the hospital, and don’t be afraid to get on the phone or into the office with your doctor after your discharge. Your body goes through some craaazy stuff giving birth, and your physical and mental health matter just as much as your baby’s health does! After all, you can’t take care of your kiddo if you’re not healthy, too! Thanks to Anneliese Lawton for reminding us moms that our health matters. What kind of postpartum care did you have? Was it enough? Why or why not?